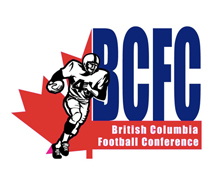 The BCFOA awards Life Time Memberships to members of the Association who have contributed many years of service to football officiating and volunteer much time to the betterment of officiating. Started his football officiating career by volunteering as an amateur sideline official in Delta (Ladner) BC at age 23 in 1969. Joined Vancouver City`s officials association, (BCFOA), in 1973 and then was appointed to the Junior football panel in 1976. Dennis received his first Junior playoff and High School final in 1980. Dennis was elected President of BCFOA in 1980 and that year was assigned to the CIS’ UBC crew. 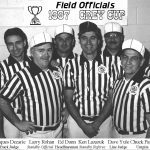 In 1982, Dennis and his family moved to beautiful Victoria where he joined the Vancouver Island Football Officials Association and became its President in 1989. In 1991, he was instrumental in negotiating a merger with Vancouver and creating a Provincial Association operating as the BCFOA, that season he was appointed to the Canada Cup. In addition, he was elected President of the Pacific Football Officials Association which was responsible for College football in BC. In 1993, PFOA amalgamated with the BCFOA. From 1993 to 1997, Dennis continued to be assigned Junior Football playoffs and Provincial Finals. As well, was appointed to Canada West playoffs from 1995 through 1997. Other major achievements were the Churchill Bowl (CIS Semi-Final) in 1998; Cullen Cup (BCFC Final) in 1998, the Canadian Bowl (CJFL National Championship) in 1999, the Vanier Cup (CIS National Championship) in 2005 and appointed the Gold Medal Game in the Canada Cup in 2011 at 65 years of age. Dennis continued to serve on the BCFOA from 2003-2009 as Vice-President of Canadian and then President from 2009-2011. As well, he was elected and still holds the position of Vice-President CFOA, (Canadian Football Officials Association), in 2006. Dennis continues to work for BCFOA and its members, but had retired from the Junior Football Panel. 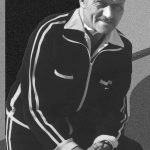 Fondly remembered as the head coach at Steveston High School for more than 20 years, Ian Anderson was also a very skilled, highly praised high school official. 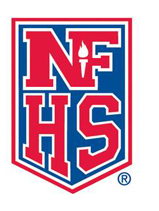 He served as President of the BCFOA, was instrumental in recruiting numerous former players and coaches into the officiating community and served as an ambassador of high school officials well after his coaching tenure was over. A true gentlemen on the sideline, he was also a strict disciplinarian with players and assistant coaches. Respected the role officials played in every game and went to great lengths to ensure enjoyment by all. Also served as President of the Coaches’ Association for many years and was instrumental in developing and strengthening many of the policies and procedures forged between the two organizations. Bill served as educator and allocator for many years. Single-handily recruited many BCFOA members still active at present. Bill Diett was honoured with an annual award presented to the BC High School football team that shows the highest degree of sportsmanship. Member for more than 25 years, Bill was consistently relied upon to provide leadership, serve as a mentor and role model, displaying an always calming demeanor and a giving spirit. Bob knew his rules and even if he was wrong nobody, and we mean nobody, would dare tell him he was wrong. A member for more than 35 years, Bob preached hard work, attention to detail, a dedication to learning/improving and instilled a sense of pride in individual and crew performance. Max was one of the best teachers of the Game to ever lace up cleats. He was a teacher by trade; a teacher on the field, a teacher off the field, and that made him a great life skills teacher. Among small college football’s best and most-distinguished officials during the 1970’s and 80’s. Recognized on both sides of the border for excellence, Max paved the way for acceptance by Canadians in USA-based football conferences. Bud was among the first off-field evaluators that the BCFOA used. He set the stage for the development of our current evaluation system that helps to improve officials’ performances. Bud officiated with great passion and he evaluated with great passion. Hi passion for the Game showed in all he said and did. A member since the 1960’s, Bud migrated to Canada from South Kitsap, Washington. While slowed by illness in the past several years, Bud’s “no-nonsense” straight-shooting approach prompted a change in attitude, commitment and determination for some, but made better officials of us all. Maury was a retired CFL official, having worked in the league from the late ‘60’s (I think) through early ‘80’s. Maury was a Supervisor of CIS officials. He also served the Association in numerous capacities — Educator, Assignor, Mentor, Evaluator. He was one of four football-playing brothers at Vancouver College. His family owned and operated a hotel in Vancouver for many years. Maury was a VC Hall of Honour Inductee in 1991. Bob taught at Cambie, Steveston, and finally Hugh Boyd High School until his retirement in 1987. 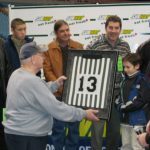 Bob was instrumental in starting the high school football programs in Richmond and spent many years coaching and refereeing football throughout the Lower Mainland. Bob had a great sense of humour and is still missed by many people in the BCFOA community after his passing in October, 2010. Mark continues to officiate on the field. He is currently President of the Association, having also been previously back in 2002 to 2007. Mark has the ability to make everyone who officiates with him think they are better than they are because he makes doing a game with him so easy. Mark has proven leadership qualities, a classic “over-achiever” and a record of accomplishment. He has an engaging personality, a commitment to excellence and has earned the respect of coaches and players as one of the BCFOA’s best officials, regardless of rules set. Matt was arguably the BCFOA’s “first” great high school official. Joining the organization in the 1960’s, he was one its original driving forces and shining stars. Matt, seemingly, coached football in BC forever. Beginning as an assistant and then head coach at Steveston, moving to Cambie and elsewhere, Matt retired from coaching in the late ‘90’s, only to be recruited to Lord Tweedsmuir in Surrey, when they began a football program in 2005. He served on the Varsity, JV and Grade 8 staffs. While Matt’s teams were always well coached and well disciplined, they also were most respectful and complimentary when dealing with officials. 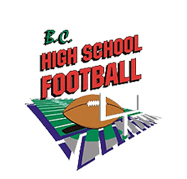 Matt held the position of President of the BCSSFCA for several years and was instrumental in strengthening the bonds between football coaches and officials. Was the consummate “professional” on the sideline, but also very capable and productive an the field as well. Matt served the BCFOA in a number of capacities: President, Educator, Sage, Advisor. Arguably, Charlie Phipps was the BCFOA’s finest umpire. Nicknamed the Tuna, he played #73 for the UBC Thunderbirds. Honing his skills as both a high school and Canadian-rules official in the ‘70’s and 80’s, Charlie became one of the US small-college best until he retired in 1998. While holding officials very accountable as the head coach of Hugh Boyd Junior High School in Richmond, regularly demonstrating his competitive spirit, Charlie was also the first one to praise solid performance. As an official, developed a degree of understanding and communicating, especially with the “bigs” in the trenches, not equaled by many. Highly motivated toward excellence, Charlie was also an excellent educator, evaluator and mentor. Retired from officiating and teaching in 2002 and moved to Whistler where he served as a golf instructor/head marshal. Charlie died in September of 2008. 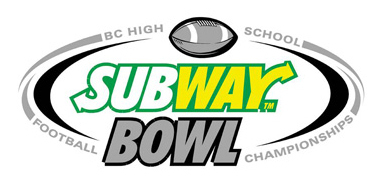 Bill was one of the original CFL officials in BC as part of the acceptance of the BC Lions into the league. 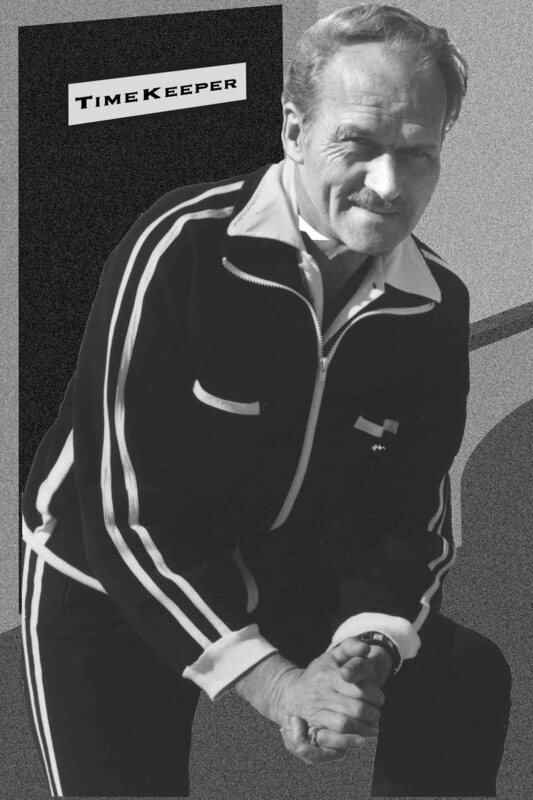 He officiated in the CFL until 1965. 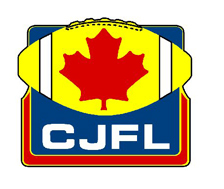 One of Bill achievements was being involved with the editing and simplifying of the CFL rulebook. Bill was the CFL Timekeeper in charge of ‘off-field’ officials, i.e. : Assistant Timekeeper, 20 second Clock Operator; Commercials Timekeeper and the Stadium PA Announcer. Bill Last CFL game worked as a Timekeeper in the 1987 Grey Cup. Larry is still very active today with BCFOA as the Provincial Education Coordinator as well as the Allocator for BCFC and CIS. 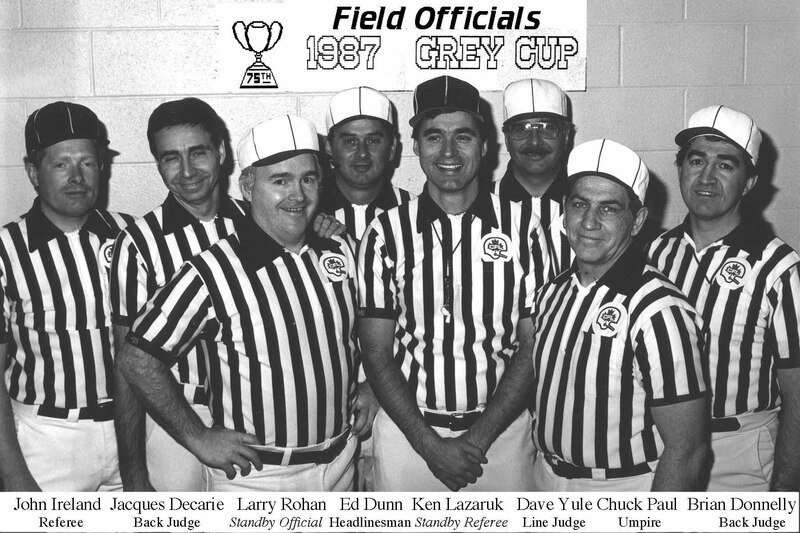 Larry was an active CFL official from 1976 to 1991, when he retired. Larry has nearly over 50 year of officiating experience both in Canada and the United States. 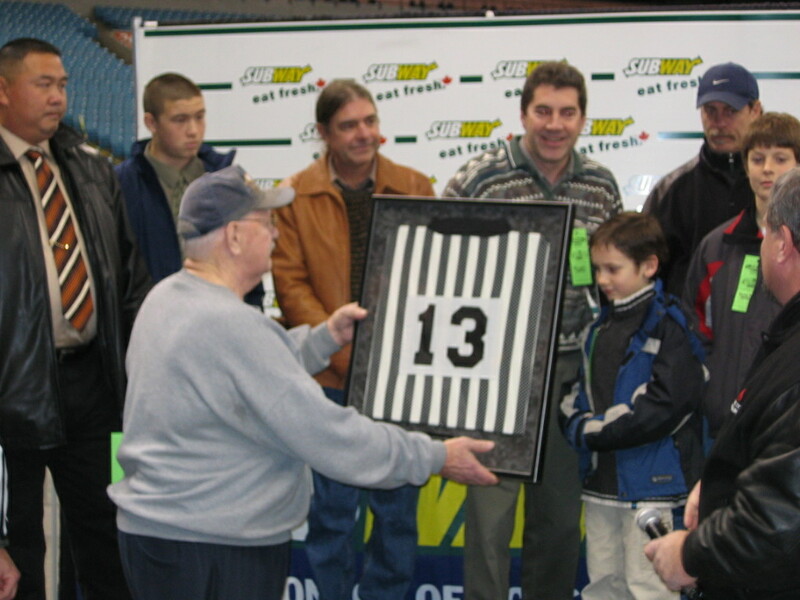 Officiated 300 CFL games over 15 years. Larry’s love for the Game shows in a unique way. He will talk Football anytime, anywhere, to anyone. Wayne was the CFL Communication Coordinator until the late 1990s. An ever-engaging personality, Wayne has acute “people skills,” an ever-increasing resume of performance, and an uncanny ability to judge each play with a high degree of accuracy and efficiency.